The iconic Mantra was the first ski of its kind to master everything from powder to ice with ease - introducing the next all mountain benchmark, the M5 Mantra. The key innovation on the 5th generation Mantra is a new way of arranging the metal layers called Titanal Frame. The metal sections follow the ski shape in the tip and tail, with an added carbon inlay in the tip. This intricate construction is lighter in weight, with the same dampening properties as a full sheet of metal. Its new shape is 134-96-117mm, with a tightened radius of 19.8m in size 177. Tip and Tail Rocker design with camber underfoot, andn Full Sidewall construction round out the setup. 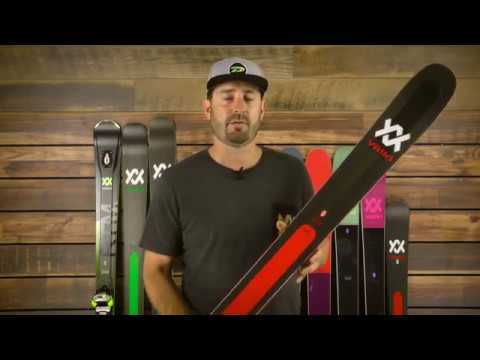 Yet another new performance standard for all mountain freeride skis. Lightweight without compromising performance - 50g less than the traditional Mantra! "What sets the M5 Mantra apart is its groundbreaking construction. Völkl’s skis are justifiably famous for their sturdy wood cores sandwiched between two sheets of titanium alloy, but they tend to be on the heavy side. To maintain ride quality while stripping away grams, Völkl reinforced the perimeter of the ski with Titanal, a NASA-grade aluminum alloy, shedding weight from the center."